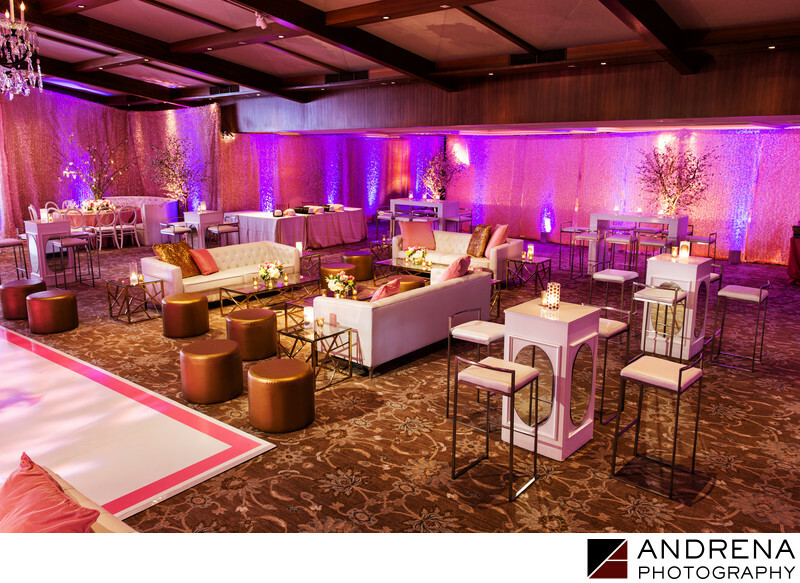 Pink, gold and white is a classic color combination for events honoring girls, but when one gets to be Bat Mitzvah aged, creatives like this Los Angeles coordinator must know how to age it up to be worthy of an elegant young lady. We say job well done to the team that executed this study in vibrant pink, luxurious gold and elegant, creamy whites. The hot pink border around the spotless white dance floor gave it a flirty feminine frame, while modern mirrored high tables with cool geometric chairs and corresponding end tables definitely make the statement "this girl is growing up." This lounge abounds with sophistication, but there's still room for kids to be kids. Not long after this photo was taken, hundreds of them poured in to enjoy games, candy and tons of custom swag. After some festive dancing, these lounges were soon filled with kids enjoying food, SnapChat and Instagram.